Your financial health is dependent both on doing necessary financial tasks and avoiding financial mistakes. On the other hand, the health of many commission-based financial institutions is dependent on getting you to purchase products you’d be better off avoiding. Take my Bank for example. Recently, I received an offer for $1,000 of no-cost insurance coverage, paid for me by my bank. I’d forgotten how much marketing happens as a result of banking products. The idea is that once a financial institution has you as a client, they make much of their money by offering you additional products. This is true of banks, credit cards, life insurance salesmen, and many other financial institutions with sales agents. They push products by other branches of the parent company. Then, they get paid to push third-party offers as well. There may be a setting that allows them to sell your contact information to others. There may be a setting that allows them to use your information to send sales offers from third parties to you. There may be a setting that allows them to send you offers from them regarding other products and services. Whenever they tell me they have turned some setting off, I always ask, “Is there any other settings you can set to make my information even more private?” I keep asking this question until I have some confidence that they have done whatever they can to protect my information being used in any way. In the case of my bank, they had failed to turn everything off for one of my accounts. The insurance coverage offer was for $1,000 of “accidental death and dismemberment” insurance. It was not life insurance, and did not cover if I died of sickness or illness. It did not cover intentional deaths such as murder or suicide. It only covered accidental death. One form of marketing suggests that costs should be hidden in any way possible. The offer was for free insurance coverage so why was there any possibility of being charged? The form had four check boxes ranging from $50,000 all the way up to $300,000. It also had check boxes for covering your family or just you. 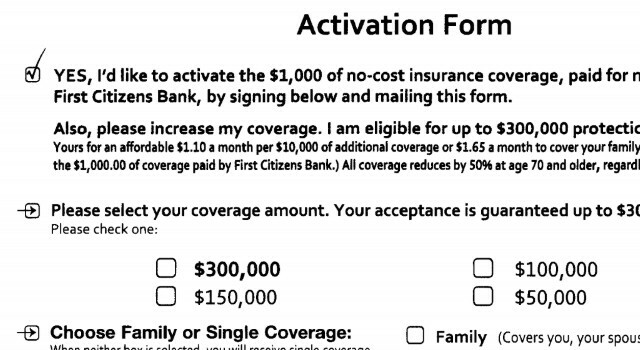 None of the check boxes were the free $1,000 worth of coverage. For that, apparently, you would have to leave everything blank. The additional coverage costs $1.10 a month per $10,000 of additional coverage or $1.65 a month to cover your family as well. Another trick of any marketing is to put the costs in the smallest possible units. There was no option for $10,000 of additional coverage, yet that is the price they quoted. The cost was expressed in a monthly charge even though your account was going to be charged quarterly. They might as well have said it would cost a penny a day for $2,000 of coverage. Had I signed up for $300,000 of family coverage my annual costs would have been $594 ($1.65 times 30 units of $10,000 coverage times 12 month in a year). And I would have been buying a relatively useless piece of insurance. If death is a risk that you want to insure against, you probably want to ensue against it even if the death is not accidental. And if for some reason you do want to insure against only accidental death, the odds of an advertised offer through your bank being the best vendor is very small. Any company resorting to spending large amounts of marketing money on this type of advertising probably doesn’t have the best rates. You can avoid a great deal of advertising by locking down your credit. Then make sure that your bank, credit cards, mortgage company, and other financial institutions will not give your information to anyone for advertising. A little bit of work upfront can save a great deal of nuisance later.